This example shows how to use RF Toolbox™ to import N-port S-parameters representing high-speed backplane channels, and converts 16-port S-parameters to 4-port S-parameters to model the channels and the crosstalk between the channels. With the 4-port S-parameters, a rational function object can be built for a differential channel. The second part of the example -- Modeling a High-Speed Backplane (4-Port S-Parameters to a Rational Function) -- will show how to use rational functions to model a differential high-speed backplane channel. With the rational function object, the Time-Domain Reflectometry and Time-Domain Transmission can be calculated for a differential channel. The third part of the example -- Modeling a High-Speed Backplane (4-Port S-Parameters to Differential TDR and TDT) -- will show how to use rational functions to calculate the Time-Domain Reflectometry and Time-Domain Transmission. With the rational function object, a Simulink® model can be built for a differential channel. 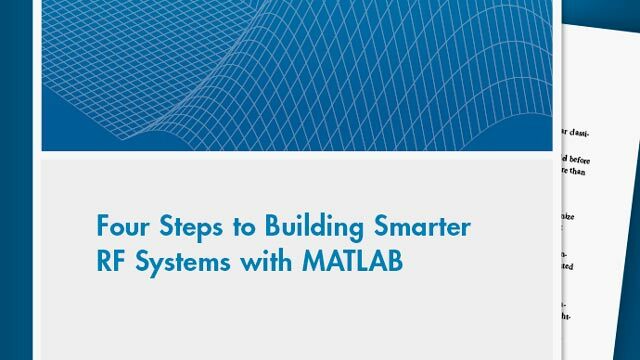 The fourth part of the example -- Modeling a High-Speed Backplane (Rational Function to a Simulink® Model) -- will show how to build a Simulink model from a rational function. With the rational function object, a Verilog-A module can also be generated for a differential channel. The fifth part of the example -- Modeling a High-Speed Backplane (Rational Function to a Verilog-A Module) -- will show how to generate a Verilog-A module from a rational function. Read a Touchstone® data file into an sparameters object. 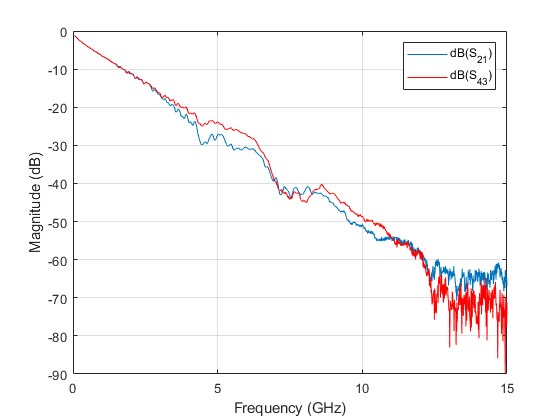 The data in this file are the 50-ohm S-parameters of a 16-port differential backplane designed for a 2-Gbps high-speed signal, shown in Figure 1, measured at 1496 frequencies ranging from 50 MHz to 15 GHz. Use the snp2smp function to convert 16-port S-parameters to 4-port S-parameters that represent the first differential channel. The port index of this differential channel, N2M, which specifies how the ports of the 16-port S-parameters map to the ports of the 4-port S-parameters, is [1 16 2 15]. (The port indices of the second, third and fourth channels are [3 14 4 13], [5 12 6 11] and [7 10 8 9], respectively). The other 12 ports, [3 4 5 6 7 8 9 10 11 12 13 14], are terminated with the characteristic Impedance specified by the sparameters object. Then, create an sparameters object with 4-port S-parameters for the first differential channel. Plot S21 and S43 of the first differential channel. % % channel into a |.s4p| file, then uncomment the line below. Use the snp2smp function to convert 16-port S-parameters to 4-port S-parameters that represent the crosstalk between port [3 4] and port [16 15]. As shown in Figure 1, these ports are on different channels. The other 12 ports, [1 2 5 6 7 8 9 10 11 12 13 14], are terminated with the characteristic Impedance specified by the sparameters object. Then, create an sparameters object with 4-port S-parameters for the crosstalk. Plot S21, S43, S12 and S34 to show the crosstalk between these two channels. % % .s4p file, then uncomment the line below.